March is over and it’s time for my monthly status update. Volatility continues to be been the story of this month. The massive sell of was lead by technology sector. My portfolio has significant (16.55%) exposure to technology and has been burnt. 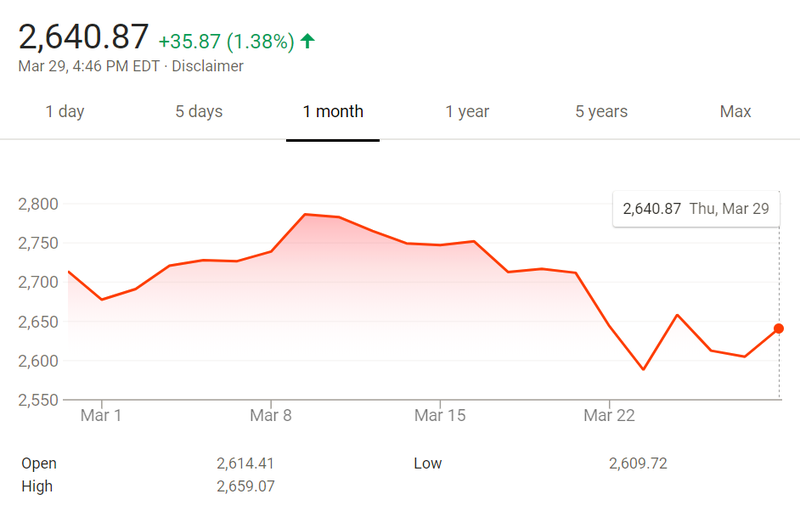 S&P 500 is down 2.688% in March. My forward dividends reached $968.83 an increase of $71.70. This is a 7.99% increase from Febraury 2018. My goal for 2018 is $1,500 in forward dividends. My forward dividends are at 64.59% of this goal. My overall investment portfolio grew by 3.38%. Slightly better than the growth in Febraury 2018(2.58%). I had a 7.07% growth in portfolio through infusion of new capital (inorganic growth). My portfolio dropped by 3.69% thanks to the drop in stock market. Largest position in my portfolio is S&P 500 ETF (39.57%) and average expense ratio is 0.072%. I added a goal of being Financially Independent (FI) by 2032. With my current investments and dividends I am at 5.77% of FI. In addition to dividends I plan on including my side hustle income in my monthly summary. My side hustle income is from Swagbucks.com, TopCashBack.com, credit cards (cash back) and Raise.com. My total side hustle income for March was $152.41. My side hustles are turning out to be a great source of passive income. My goal was to obtain $41.60 from vitality. I get vitality points for my gym visits (each point comes out to be $0.01). I think of it as a side hustle which generates money and keeps me fit. As of March 2018 I have earned $11.20 from Vitality. We have been tracking our zero dollar days in 2018. In March we have 7 zero dollar days. My dividends cover 3.13% of our March expenses. Happy to see you surging towards the $1K mark in forward dividend, DG. It's always nice to hit some milestones on the path to FI. I'm impressed with your side hustle income, too.... investing it should really get your dividend snowball rolling. Fine work all around! Keep it up. I got to take a page from your $0 spending days geek. I tried going to a cash budget, but still spend the two-week allocated money in less than one week. The value of my portfolio is down due to the market, but I don't really pay attention to it that much because I'm focused on the dividends. Great job on the side hustles, and you're so close to crossing that 4 digit mark! Transfer your money to savings immediately. That's what we do after we get our weekly pay check. We invest it almost immediately. So, it is much more work to get it back. Easy for us as we invest in ETFs. Not much of analysis to be done. Perhaps it will work for you. Great job. You are catching up to me quickly my friend. And almost hitting the 1k forward dividend mark. Keep it going! Hola DD, Close but not close enough it seems :-). Thanks! Another good month for dividends. I think there will be lots of volatility in the markets. so I am focusing on my dividends and not worrying about portfolio value as much. 7 zero dollar days, nice ! Yes Steve. I am in very early stages of building my retirement portfolio. Its not that I am young :-( Its just that I started late. So, I am very happy to pick up stocks at discount. Hey the stock market might be down but least you're reinvesting these dividends at a better price! Yes very true. My yield on cost has gone down and my cash flow is improving. Yup! Side hustles are a lot more fun than dividends. Investing in ETFs is not really interesting :-). I have a nice competition going on between dividends and side hustles. Thanks Caroline.